Ice Mario in the Freezeflame Galaxy. Ice Mario is a form that Mario can take upon touching an Ice Flower in Super Mario Galaxy. In this form, Mario's body turns into solid ice and he gains the ability to skate on water. It is replaced by a vastly different form of the same name from New Super Mario Bros. Wii onwards. While in this form, any water or lava Mario touches freezes solid in the form of a hexagonal platform (which melts after a period of time if left unoccupied). This allows Mario to walk or skate across vast distances of water or lava with ease and safety. Ice Mario can also freeze water spouts and waterfalls, which usually grant him passage to higher areas. This form also makes its user immune to fire attacks, as seen when a Magikoopa fires a fireball at Mario; it also prevents damage from torches when the player jumps on it. Ice Mario can also safely kill Ice Bats by spinning and stomping. Like Fire Mario, this power-up has a time limit. 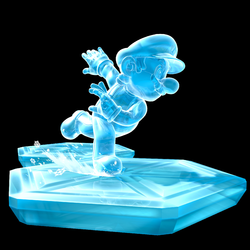 A downside of this power-up is that Ice Mario's midair spin is diminished. Ice Mario's midair spin gains almost no height, unlike Mario's regular form. Therefore, Ice Mario cannot jump as high. This power-up is introduced in the Freezeflame Galaxy, but can also be found in the Beach Bowl Galaxy and the Deep Dark Galaxy. Ice Mario is one of two power-ups in the game that was not carried over to its sequel, Super Mario Galaxy 2, the other being Flying Mario. A CHILLY kind of flower power, Ice Mario is a form that Mario can take when he grabs an Ice Flower. When he powers up to this transformation, he can walk on any body of water or lava by freezing the liquid in hexagonal platforms and simply walking across. Ice Mario in Freezeflame Galaxy from Super Mario Galaxy. Ice Mario can skate across lava too. Ice Mario skating across water. Ice Mario skating across water in Beach Bowl Galaxy. Ice Mario using ice powers to go up the waterfall in Super Mario Galaxy. The music played during the duration of this power up in Super Mario Galaxy closely resembles the music played for Fire Mario, but is played in A minor. Although the form doesn't appear in Super Mario Galaxy 2, an updated version of the theme that plays is present on the disc. The models for the Ice Flower, Ice Mario, and Ice Luigi are not, though there is code that can spawn the Ice Flower. Due to the lack of coding for Ice Mario as well as the lack of coding for the text box that appears upon initially collecting it, attempting to collect said Ice Flower results in the game crashing. 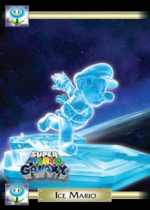 The crystal platforms Ice Mario/Luigi creates are still used in the Shiverburn Galaxy. This page was last edited on April 15, 2019, at 20:33.